Folding Pocket Mirror, Made like the original old pocket mirrors. Wood (Poplar) is hand fitted with a sliding lid to protect the mirror. Pivots on a period style brass rivet. Total length 6" and 3 1/4" wide. This is a handy little item for your haversack or display. Completely hand made by an American craftsman. A very nice addition to your Haversack or home style articles. Gold Filled, Oval lenses with sturdy rims and heavy straight temple pieces with loops on each end. Earpieces measure 5 1/2". Spectacles are 4 3/4" wide at the temples to fit most modern sizes. Screws at the temples for easy installation of your prescription lenses. Nice heavy gold plating that has shown a good wearability. Pocket Watch, Similar to the above watches, only with a finer case and roman numerals on the face. Battery operated. Comes with a watch chain included. Choice of Gold Finish or Nickle Finish. Pocket Watch, Similar to the Quartz watches above with the Eagle design. This style is more of a ladies watch, in a smaller size than the rest of our pocket watches. These feature an antique bronze finish with the eagle as shown. Closed face style and they come with a finely fashioned neck chain. These can also be used with any other watch chain, metal or hair. Candles, Beeswax, 7" long. Made in an original period candle mold. Genuine Pure Wax from bee honeycombs, melted down and free from impurities. Bone Toothbrush, Real Bone handle, natural boar bristles, 6" long. Fine quality and useable........... Not available at this time! Clay Pipe, Salt Glazed from grey or white clay. Effigy or plain style. Designs can vary, but all are period types and copies of original designs. You can specify your desired style. We will try to pick for you, but will ship what we have on hand at the time. With reed stem ...........................................................$17.95 ......Now In Stock and ready to Ship! Hand made in the South from dried oak saplings, hand carved and drilled with a genuine river cane stem. These have been very popular at reenactments so we bought enough to offer them on our website. Tin Matchbox, Handy little match box holder made from tin by the Village Tinsmith. Measures 2 1/2" X 1 1/2" X 5/8" and just the right size to hold one of our boxes of Lucifers. Has a rough edge on one side in case you can find some "strike anywhere" matches. Sliding cover that keeps everything protected from the elements. Chewing Tobacco Pkg, "Queen of the West" or "Minnie Ha Ha". Period paper wrappers that are copied from some originals that we have. Size is the same as the originals as well. Inside is a factory wrapped cut plug of chewing tobacco such as "Days O Work", etc. Great for display or your living history impression. Fresh and chewable. Specify your choice. Pipe Tobacco Pkg. "Big Nosed Greek" or "Indian". Period paper wrapped package with an applied paper label. Choice of wrappers as shown. The tobacco inside is typically Captain Black or similar pipe tobacco, contained in a zip lock vinyl package for freshness. Great for display or your living history impression. Fresh and smokeable. Specify your choice. Hard Tack, Individual Crackers made from an original recipe. These are soft enough to chew, not hard and brittle. Eat them "as is" or cook them with your Bacon Grease, Esc as they did in the field. Also great for display and living history exhibits. Each measures Approx 2 3/4" X 2 3/". Hand made so the size varies a little. 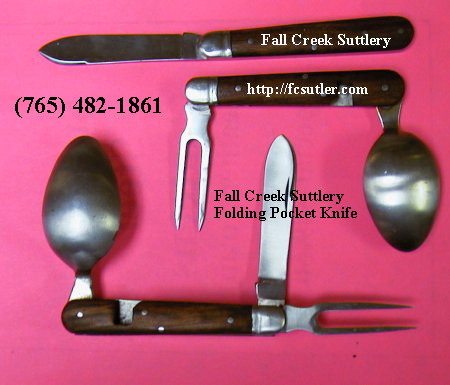 Repro Knife OR Fork, Good quality, Rosewood Handle, Copy of the originals. Carbon Steel like the originals. Fork has three tines. Knife, Fork, Spoon Combo, Like a large pocket knife. Rosewood handle. This is an exact reproduction of the example in our collection. The term "Damascus" steel in modern times refers to the very evident grain pattern in the steel. The steel is folded and forge welded onto itself over and over again, similar to making flaky biscuits. Once the process has been completed, the metal stock is hammered and formed, then filed down to the finished knife shape. After completion the metal is treated with mild acid to bring out the visual layers. The layering effect is actually the impurities on the outside metal surface, folded onto itself each time. The acid wash removes a miniscule amount of the impure metal which produces the effect. Many blacksmiths pride themselves in their ability to perform this process using their forge and anvil. All of the work is very time consuming and laborious but the finished product is worth the effort. The "Damascus" process is usually worked with very hard material, so once finished, the knives hold and keep a very sharp edge. We have a nice selection of period style shaving items that are close to the originals. hand thrown shaving mug with salt glaze finish featuring a cobalt blue American Eagle. All four items are fully functional and will look great with your impression. We are offering them separately or as a set. Buy the set and save a few sheckles. All four shaving items.................$---- set - NOT AVAILABLE AT THIS TIME! Shaving Mug Individually: Currently out of stock. CW Playing Cards, Period style paper wrapper secured with string. Authentic style heavy paper cards with no numbers.."A.Hardy, Maker". Rev War Design, Correct for CW or earlier useage....................................Sorry these have been discontinued! Playing Cards, Buffalo Soldiers. African American Military Contributions, 1866- present. Playing Cards, Famous Women of the Civil War. the powder fresh and dry.